As-salamu alaykum and hello everyone ♡. Today I am going to share with you some skincare tips when going on a holiday! Did you know that the type of weather – hot, cold, humid, dry or windy – can really affect your skincare routine? So I am going to cover on 2 different types of weather we commonly experience during holiday and how one should take care of skin under these conditions! Obviously the pictures below are photoshopped just to give you a little picture of the seasons! Haha! Hot weather? Yes, it’s summer time! 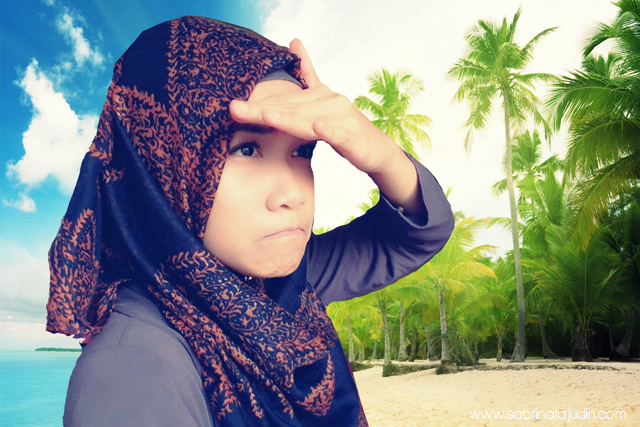 These tips can be applied to those of us who live in countries which experience the summer season as well as anyone who would love to come to Malaysia where it’s summer all year long! Other countries that experience hot weather all year long are Middle Eastern countries, Asian countries such as Singapore, Thailand, Indonesia; Puerto Rico and places such as the beaches. So if you are planning to go there, here are some tips and things you need to bring along! Clean – Hot weather makes your skin sweaty and sticky which in means that you pick up a whole lot of dirt on your face. You need to clean your face at least twice a day. So a good cleanser that helps to remove all impurities is the answer! Try the SK-II Facial Treatment Gentle Cleanser. This foam cleanser with a natural rose scent cleanses impurities around and inside pores while enveloping your skin with silky smoothness. Prevent Sun Damage – Protect yourself from the sun’s harsh UV rays. Using sunscreen is one of the most important routine in your skincare steps. Remember, sun exposure can cause alot of damage to your skin! Especially when you go out tanning, you need to protect your skin from the harmful UV Rays. Try the SK-II Cellumination Day Surge that can give you protection as well as translucent glow! Moisturise Correctly – Under hot weather, using a heavy moisturiser can be uncomfortable for your skin. So try to choose a light essence as your moisturiser. Something that is not heavy but which can still give you the hydration you need. In Asia, moisturiser is also known as milk. It is much lighter, try the SK-II Facial Treatment Milk to help your skin cope with the heat and possible humidity in hot countries. Now, to the cold weather places! I am imagining European countries, Korea, Japan and more! People like me, who usually experience hot humid weather, need to take a little precaution on what skincare we have to bring when we visit cold countries! In cold weather, the air has less moisture and can cause dryness to your skin! So here some tips on how to deal with dryness. Hydrate – Drink lots of water to retain your skin hydration. Your lips can also be super chapped and your skin will turn dull no thanks to dehydration. Personally, I think that the SK-II Facial Treatment Essence would be ideal to bring along wherever you holiday. I think it suits both hot and cold weather and can be used for to combat skin dryness. Heavy Moisturising – Owing to the dry weather in cold countries using a good deep, heavy moisturizer is a must! Use a good heavy moisturizer that can last through the day and that can help to keep your skin brighter without making you look like a sick person. Try the SK-II Cellumination Deep Surge Ex. This product is packed with all the hydration you will need. Pampering – Treat your skin right! Give your skin a little pampering with a good mask! This provides more concentration to your skin and works wonders! Try the SK-II Facial Treatment Mask. I have tried it and it is seriously good. Even Harper’s Bazaar recommends using it during winter! Do you have any travel tips? Share your comment below! i loveeee all your writings! detailed reviews!